A prepaid Visa card from AccountNow is an alternative to a traditional checking account. By keeping your funds on a prepaid debit card, you expose yourself to less risk than carrying cash everywhere and you save hundreds of dollars per year on check cashing fees. AccountNow prepaid Visa cards are issued by MetaBankTM under a license from Visa, and they are accepted anywhere that takes Visa debit cards. If you are unable to obtain a checking account due to information on your ChexSystems report or for any other reason, or if you simply do not wish to deal with a traditional banking institution, an AccountNow prepaid Visa card is a viable alternative. Below are some of the benefits of using a prepaid Visa debit card from AccountNow (www.AccountNow.com). Prepaid Visa cards are direct deposit enabled. Your employer or benefits provider can set your funds to be deposited directly onto your card. You can add cash to your card at many convenient locations, including Western Union, Money Gram, and Green Dot. If you already have a checking account but wish to use another prepaid debit card for convenience or for safety, you can easily transfer money between your checking account and your prepaid card. AccountNow prepaid Visa debit cards are compatible with PayPal. When you load cash onto your card using any of the above methods, your money is available immediately. You can use your AccountNow card to send money to anyone. Workers who lack checking accounts throw away part of their hard-earned paycheck every week because they get it cashed at one of those check cashing shops on the corner. These businesses are notorious for preying on workers, particularly those of limited means, by charging them higher fees than necessary for simple services. Many people continue to do business with these places because they are under the impression that without a checking account, there is no way to sign up for direct deposit with their employer and thus avoid check cashing fees. The AccountNow prepaid Visa debit card was created to fill this void, and it has saved its customers who previously availed themselves of check cashing joints hundreds. 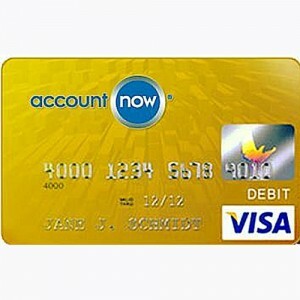 Signing up for an AccountNow prepaid Visa debit card and activating it at AccountNow.com is very simple. Just follow the steps below. Fill out the one-page form on AccountNow’s sign up page. Once your ID is verified, you will receive an instant approval. The approval rate for applicants with valid IDs is 100 percent. No credit check is required. When your card arrives in the mail, go to the activation page on AccountNow’s site and enter your card number. Next, simply retype your card number for verification purposes and hit “submit”. Once you do this, your card will be active and ready to use. Once your card is active, you can start experiencing all the ways in which having a debit card makes your life easier. For example, you can load money on it and use your card to make purchases online, which of course cannot be done using cash. You also can sign up to have your paycheck directly deposited onto your card, at which point the funds will be available instantly. This works whether your income is derived from wages, a retirement account, or government benefits. Finally, if you have any cash lying around that has accumulated due to a lack of a place to deposit it, such as a checking account, now you can put it on your card and keep it safe from theft or fire. A prepaid debit card is a viable alternative for those who are unable or who do not wish to obtain a checking account. AccountNow makes it easy to apply online and be approved for one that works anywhere Visa is accepted.